Uncovering the Mystery of the Beaumont Children was written due to a tip off . A tip off which resulted in eleven years of investigation in which Mullins , Hayes and Whiticker continued their hunt for the truth. The Satin Man book looks at a new potential suspect , a person of influence , money , persuasiveness and power . 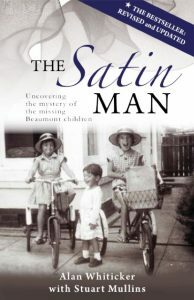 A family patriarch , a man with a peculiar predilection for satin that is now being looked at as highly likely being involved in the disappearance of the three Beaumont children . A person hidden in clear sight . A wolf in sheep’s clothing . This man that of early 2018 was raised to a person of interest by Major Crime South Australia . This has red flags all over it . Let’s shake the tree and see what falls out. Mullins ,Hayes and Whiticker did shake the tree . Which has lead to Harry Phipps the Satin Man being only the 6th person in the 50 + years since the children’s disappearance to be a raised to person of interest in regards to this case by Major Crime South Australia . And also now rated by many professionals world wide as the person most likely involved into the disappearance of the missing Beaumont Children .There are just simply too many overwhelming co incidences in relation to the Satin Man Harry Phipps to be ignored any longer. Harry Phipps the Satin Man is now rated as the person most likely involved into the disappearance of the missing Beaumont Children. And rightly so .He is now raised to a person of interest by Major Crime South Australia.